Jared Anderson, Voices of Light Choral Director, is Associate Professor of Music and chair of the Department of Visual and Performing Arts Department at Michigan Technological University where he conducts conScience: Michigan Tech Chamber Singers, the Michigan Tech Concert Choir, teaches courses in music theory, group voice, and basic musicianship, and coaches singers in Tech theater productions. Originally from Orem, Utah, Dr. Anderson has conducted ensembles in Utah, Minnesota, Wisconsin and Michigan. 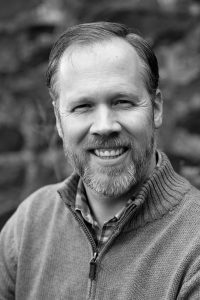 He has worked with and conducted ensembles of all sizes and voicing, with singers of many different ages and backgrounds, including Northland Singers, the Northland College Chamber Choir, the Lumberjack Chorus, the Duluth Superior Symphony Orchestra Chorus, the University of Minnesota Men’s Chorus, the University of Minnesota Concert Choir, Brigham Young University Singers, the Brigham Young University Women’s Chorus, and an inmate choir at the Utah State Prison. Dr. Anderson has been an active choral singer all his life performing in venues and festivals worldwide including in representative choirs at both the 4th World Symposium on Choral Music (Sydney, Australia), the 6th World Symposium on Choral Music (Minneapolis), and the Ravinia Festival. He has performed in choruses with the Israel Chamber Orchestra, the Chicago Symphony Orchestra, the Minnesota Orchestra, the Saint Paul Chamber Orchestra and the Mormon Tabernacle Choir. While living in Minneapolis he served as tenor section leader in the Dale Warland Singers. He is an active member of the American Choral Director’s Association, Chorus America, the National Collegiate Choral Organization, and the National Association of Teachers of Singing. Dr. Anderson is an advocate for ensemble singing and the transformative power of singing in building caring communities. He is married to Jane Anderson; they are the proud parents of three children. Thurs., 11/2, 7:30 p.m., 7:30 p.m.